Choosing the best push carts that suit your needs is not as simple as many golfers tend to think. For this reason, it is important to select the perfect golf push carts regardless of whether you are playing for your own amusing or professionally. The best golf cart combines the utility of a golf cart with the ability to follow the ball without having to stick to a particular cart path. Another reason why most golfers prefer pushcarts is the price. Self-drive carts are extremely expensive, especially when you compare them with the other carts. To assist you in selecting the best golf pushcarts, read these reviews of the best golf carts. 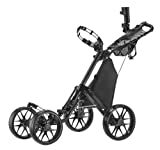 The CaddyTek EZ-Fold is a three wheel golf pushcart that comes in a compact size. It is constructed using scratch resistant and durable materials to ensure long-lasting service. The cart also comes with a comfortable handle and has an adjustable system that allows you to adjust the front wheel. For convenience, this pushcart is easy to fold into a compacted size for you to keep in your car while transporting it to the golf course. Additionally, the model comes with the patented press brakes that require you to press them again to release. The CaddyTek Superlight Deluxe Golf Push Cart is a simple three-wheel pushcart that is incorporated with features that you can only find on the higher end models. Some of the features that it comes with include the foot brake, umbrella holder as well as mechanism for wheel alignment. The product also comes with an adjustable handle making it comfortable for both tall and short golfers. Another excellent feature that comes with this model is the high-quality frame as well as low maintenance wheels. If you are looking for something sturdier yet lightweight, then the CaddyTek One-Click Folding 4 Wheel pushcart is the ideal choice. You do not have to worry about carrying the cart as it features a patented one-click fold button that folds it into a compressed size for you to carry in your car’s trunk. The model is constructed using well-built aluminum frame making it not only durable but also lightweight. Some of the other exciting features include the patented press to break and press to release, EVA maintenance-free wheels, mesh net placed on the handle and umbrella holder. The stylish CaddyTek Superlight Explorer 4 Wheel offers the user with advanced technology in a compact design. This model boasts of a strong aluminum tubing and four maintenance-free tires that will ride smoothly over all terrain. 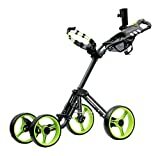 One of the reasons why most golfers prefer this model is because you can adjust the wheels between 11.5 to 12.5 inches so that you can fit any bag. This will also add the stability. This model comes with a full feature extra scorecard holder as well as an extra wide and durable frame. 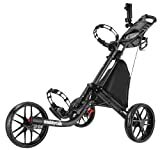 Most golfers who have already purchased this model are happy with its ease of use and ability to fold it to make it compact by a simple folding mechanism. The cart is designed to carry everything you need on the course easily. Other impressive feature that comes with this model includes 28-inch wide body design for effortless pushing Umbrella holder and storage rack. 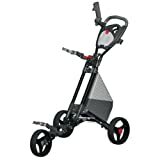 If you are looking for a quality golf pushcart but you are on a tight budget, the Jef World of Golf Deluxe Steel Golf Cart is a perfect choice. This model is lightweight sturdy and features a design that opens and closes in one fluid motion. The model is constructed using steel thus enhancing both its performance and durability. Another excellent feature that comes with this pushcart is the maintenance free and durable wheels. This is one of the most sophisticated yet simple to use carts available on the market. Ti comes with a robust and durable frame that allows you to carry all the equipment that you will need while playing golf. The cart also offers easy folding mechanism making it easy to carry around. Some of the other features that come with this model include scorecard holder, Low maintenance airless tires, umbrella holder as well as it includes drink holder. This is another excellent product from CaddyTek that offers you with convenience and long-lasting service. The model is constructed using high quality yet lightweight materials enhancing its performance. It is a four-wheeled cart making it more stable. This will allow you to carry more equipment than other carts on the market. Additionally, the model is simple to fold using two simple steps making it easy to store in your car trunks. There are many reasons why you may consider selecting this pushcart. The first useful feature that comes with the product is that the golf bag remains on the cart when folded. The cart also comes with quick two-step fold that makes it compact enough to fit in your car trunk. This is great as it makes it very simple to transport. Additionally, this model is lightweight and comes with solid foam maintenance free tires. 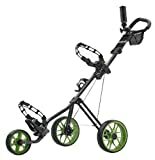 Besides the impressive design that comes with the Paragon 3-wheelie Golf Push, the model comes with a wide aluminum tubing construction that makes it sturdy and easy to push around. The model also comes with an adjustable handle allowing it to accommodate different heights easily. Some of the other great features that it comes with includes a free cooler bag patented foot brake, umbrella holder, as well as a cup holder.